The dock at Bambarra, Middle Caicos. This page refers to the settlement of Bambarra. For information on the beach here, see Bambarra Beach. Along with Conch Bar and Lorimers, Bambarra is one of three settlements on Middle Caicos. The second largest settlement on the island, nothing much happens in this sleepy village. Only two churches, a school, a few villas and some private residential homes are found here. No shops or restaurants are located here. The current inland site of Bambarra, where the churches are found, once the site of the circa late 1700s George A. Gamble British Crown grant and subsequent plantation, and some ruins and field walls from this sea isle cotton agricultural attempt still remain. 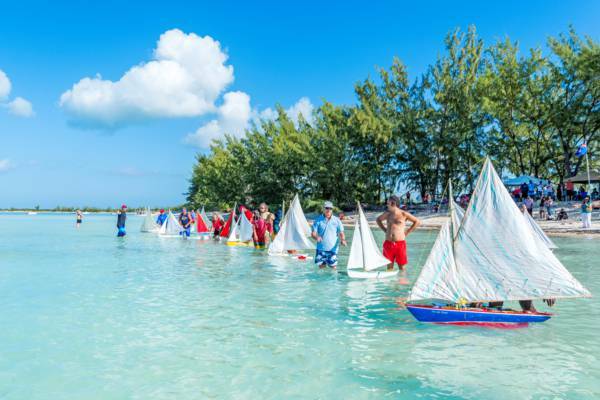 Every year on the Saturday closest to February 14, the annual Valentine's Day Cup model sailboat race is held on the excellent and sheltered Bambarra Beach. This event is draws in people from across the country and is the only day of the year that could be considered “crowded” in Bambarra. The beautiful model sailboats at the Valentine’s Day Cup. Many of the boat models mimic the smooth lines and simplicity of the Caicos Sloop, a vessel that was essential to the Turks and Caicos in times past. If you plan to visit North Caicos and Middle Caicos on the day of the Valentine’s Day cup, we advise reserving your rental vehicle well in advance, as availability is often limited. Likewise, the ferries from Providenciales tend to be quite busy, so consider arriving a bit earlier than usual to the dock. Many of the residents on Middle Caicos and North Caicos are descendents of the Trouvadore, a Spanish slave ship that was shipwrecked in 1841 near East Caicos. Due to the fact that the slave trade was illegal in both the United Kingdom and Spain at this time, the ship was operating illegally and exact records of it's origin and route are not known. Many Caribbean slaves had their ancestral origins from the western coast of Africa. Mali (located on the western part of Africa) is home to a large ethnic group called the Bambara (with a single 'r') people, and it's quite possible the slaves were from this group. This is a likely origin of the current name Bambarra. 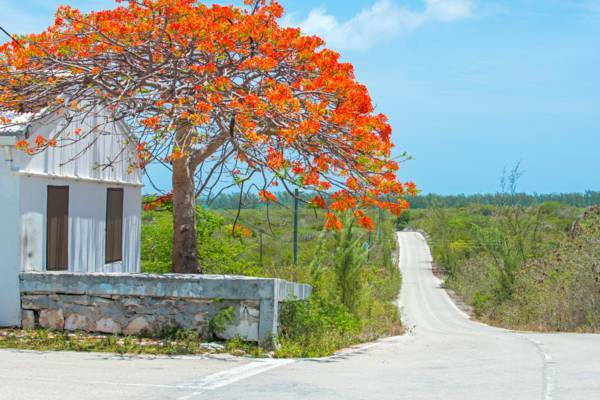 This village is the namesake for Bambarra Rum, a rum-blender based in Providenciales. An interesting natural Karst feature is found to the west of Bambarra. Quite apparent from aerial images, Corry Pond is a perfectly circular sinkhole that reaches a depth of about 40 feet (12m). This strange feature exhibits distinct and strong haloclines (water layers of high salinity) and thermoclines (water layers with distinctly-varying water temperature), as well as deep red, green colour in the distinct upper water layers. Corry Pond is reminiscent of and likely an example of one of the globally-rare Black Hole Karst features that are only found on Andros Island and Grand Bahama Island in the Bahamas, and of which there are only thirty known in the world. Another interesting element here are manmade rock walls inside the pond. The purpose and age of these features was lost until recently, when the research of archaeologists and a local botanist concluded that they were sisal “rock corrals”. In the latter 1800s and early 1900s, the sisal agave was raised in the Turks and Caicos for the production and export of rope fibres. The large sisal agricultural attempts on East Caicos and at Yankee Town on West Caicos had steam and kerosene power and T. A. Smith’s patent “Fiber Decortigating Machine” to separate the fibre from the plant stalks, yet the smaller farms and plantations were not so fortunate, and had to practice the time-consuming process of soaking the stalks and then beating them against a hard surface by hand to extract the material. The rock corrals simply contained the stalks while they soaked.